Scooby Doo – Relp, Green Ghost! The Green Ghost has Mystery Inc. on the run, with Scooby-Doo leading the way. “Relp…It’s The Green Ghost” suggests a classic action moment when all five main characters run in panic from the onset of the phantom green ghost. 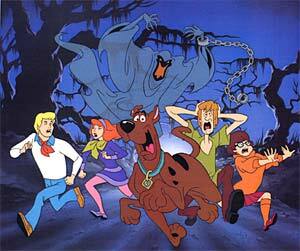 The Green Ghost image is taken from “A Night of Fright is No Delight,” produced on June 10, 1970, where Scooby is set to inherit a fortune from a man whose life Scooby saved.